Long ago when the world was new and the oldkin walked the lands there was one named Joomavesi. Joomavesi was beautiful and her black hair rippled and folded like the mountains. For long she walked beneath the stars seeking paradise and she found it on an island where the heart of the earth boiled the sea. The island was a special place. A magic place, full of life. Joomavesi had walked so far and so long beneath the stars that her stomach rolled and hissed like the steaming ocean. And then, as the sun began to rise, she saw the crabs. A thousand thousand crabs of gold marched out of the water and rushed across the island like a wave. As the crabs swarmed past her, Joomavesi plucked one from the mass and broke its body in her hands. She ate it raw, such was her hunger, and its meat was sweet with a whisper of the sea. It was delicious! Joomavesi fell upon the crabs. Her hunger insatiable. For a year and a day Joomavesi ate of the crabs. Each morning swarms of the golden creatures rushed from the waves to cross the island, and each evening the black sands were dressed in broken shells and claws of gold. Each day Joomavesi prepared the crabs in a different way. This is why she is the mother of all cooking. She baked them and caked them and spun them on spits. She stewed them and souped them and dried them in pits. She boiled them in pools close to the heart of the earth and streamed them in the mountain's vents. The piles of shells and claws grew larger, and Joomavesi was content. And then, the crabs did not come. For six days she waited by the sea, and still they did not come. On the seventh day without crabs Joomavesi cried out to the sun, "Golden One! Where have you hidden your children? They are gold like your rays, and they rise and rush with you each day. What have you done with them?" And the sun said, "Oldkin! Gold they may be, but they are not my children. I surely loved watching them run each day and seeing my rays bounce off their bodies and dazzle the air. I do not know where they have gone, and I have seen you among them. What have you done with them Joomavesi?" She cursed at the sun, "I have done nothing with them Golden One. You must be able to see them from up there. You are either lying to me, or blinded by your own radiance." Then Joomavesi cried out to the mountain. "Rugged Pillar of the Earth! Your roots stretch down to the heart of the earth and your head rises up to the heavens. 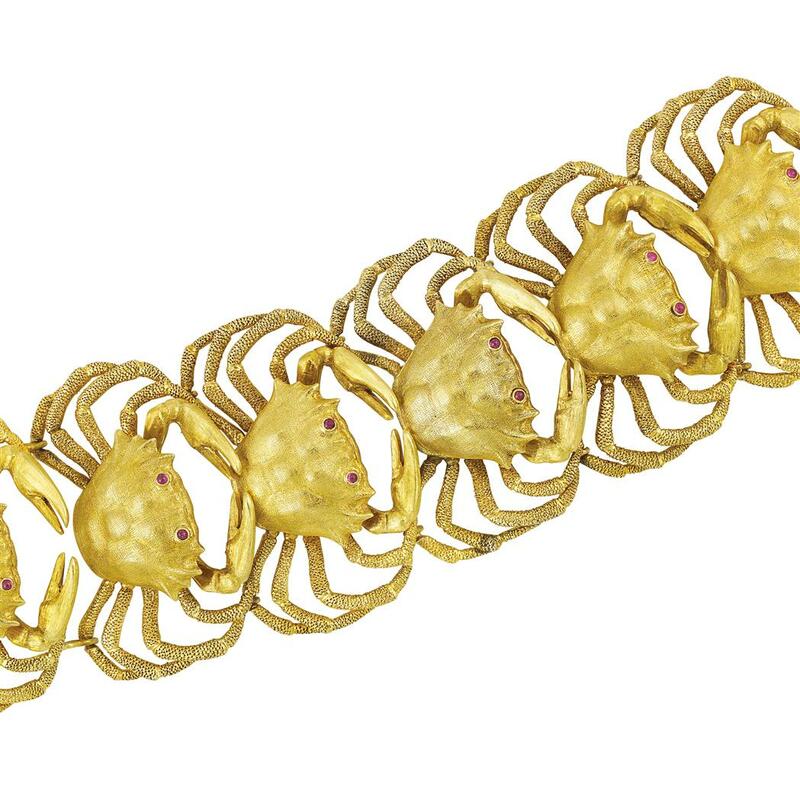 Have you seen the golden crabs? Do you hide them in your secret places?" And the mountain said, "Oldkin! Your hair is as beautiful as my folded basalt form, and I wish I could help you, but I too have not seen the crabs since seven days. On that day I heard you laughing and heard them screaming in my steaming vents. I miss the way they tickled as they ran across my face. What have you done with them Joomavesi?" She cursed at the mountain, "I have done nothing with them Pillar of the Earth! You must be hiding them in the folds of your stone cloak." In her fury Joomavesi struck the mountain and broke his crown. The mountain cried out in rage and shook with anger, but no golden crabs could be found. This is why the hot red blood of the earth still pours from cracks in the mountain. Then Joomavesi cried out to the sea. "Mother! Do the golden crabs hide in you? Where have they gone? I have not seen them in seven days, and the sun and the mountain say they have not seen them either. Surely you must know where they have gone." And the sea said, "Oldkin! You are of me. You know my secret ways and can hear every song in my currents. You know in your heart what has happened to the crabs." And Joomavesi cursed the sea. "Long have I been gone from you. You cast me out upon the land long ago and your songs are soft and forgotten in my memories. I will find where you hide them. Whether you help me or not." Joomavesi dove into the sea. She listened for the currents, but the songs were soft like faded dreams. She swam for three days and three nights before she heard the song of gold. It was so soft, and so faint and tinged with so much sadness that Joomavesi almost missed it. She followed it and found a single golden crab perched on a rock above a forest of red seaweed. Joomavesi licked her lips. She could wrap this one in the seaweed and steam it in one of the mountain's vents. The crab cried out to the oldkin, "Wait! ", and Joomavesi paused. Never had the other crabs spoken. "You have eaten my children oldkin. Let that be enough. Do not eat me, for I am cursed, but I am old and tired and death draws near. Please. Let me die." Joomavesi laughed, "Do not lie to me little golden one. I have seen a thousand thousand others. You cannot be the last. You must be trying to delay me as your kin run over the horizon, but it will not work. I am hungry and once I eat you I will chase your friends." "You are a fool oldkin." snapped the crab. "I was once as you, with soft skin and beautiful hair. I lived with my people in a village by the sea and we too ate the golden crabs until only one remained. The gold mother. She begged with me to let her die, but I too did not listen. I ate her and became her. It was my curse to bear as many children as the stars and not die until they were gone. I ask you again, let me die." Joomavesi paused. "Gold mother? I am a child of the sea. Never has there been a gold mother. Where do the others hide? Are they in the forest of red seaweed? No matter. I shall find them after I steam you in the vents of the mountain and eat your sweet meat." "You are a fool oldkin. Let me die and the curse along with me." Joomavesi laughed and gathered seaweed. Then she bundled up the crab and returned to the mountain where she steamed it in the vents of the earth. It was the most delicious crab she had ever eaten. Sweet, tender, meat kissed by the flavor of the sea. The next day as the sun rose, Joomavesi stretched her supple arms and laughed. Her skin was soft, and her hair was as beautiful as the mountains, but the crabs still did not come from the ocean. She returned to the place she had found the gold mother and looked for crabs in the red seaweed forest, but she found none. The next day as the sun rose, Joomavesi smiled and watched her beautiful hair float upon the ocean currents. Her skin was soft and her limbs were strong. The golden crabs were nowhere to be seen and so she traveled over the horizon for that is where they must have gone. Days turned to weeks, weeks turned to months and still Joomavesi looked for the golden crabs. Near the anniversary of steaming the gold mother Joomavesi grew tired. She had never managed to find another golden crab and was beginning to despair. Perhaps the crab's words had been true. As weariness began to overcome her senses, Joomavesi saw a large rock outcropping surrounded by a forest of red seaweed. It looked comfortable, and her arms felt so heavy. So she lay down and slept. When she woke she felt strange. She tried to stand but immediately fell. Her legs were no longer her own. They were the shape of crab legs. Her arms were claws covered in a golden carapace and her belly was covered in a thousand thousand tiny blue-grey eggs that squirmed with life. 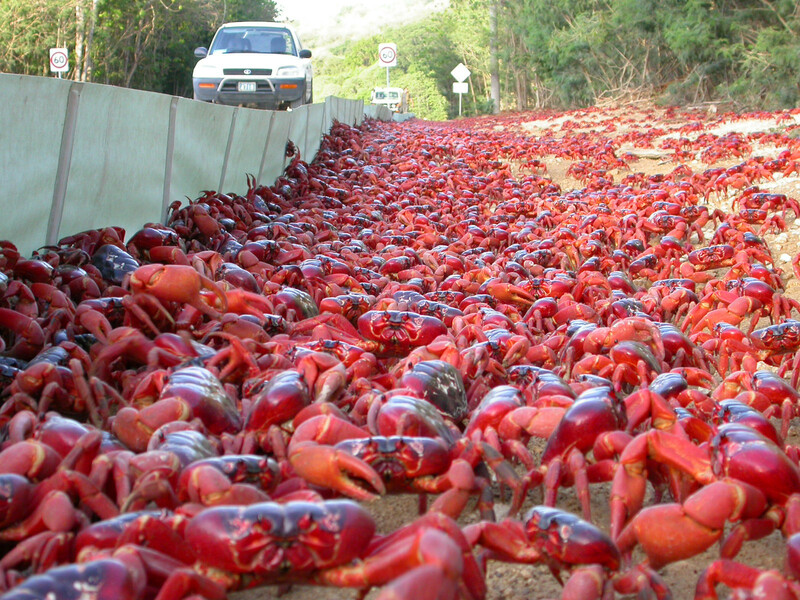 Three days later hoards of golden crabs swarmed across the island once more. The sun was happy to see his rays bounce off their bodies and dazzle the air. The mountain was happy as they tickled his face, and the sea was filled with a new song. What does Joomavesi NOT want? Joomavesi, the golden crab, is now colossal in size. She hungers and is compelled to eat her children. Like an addiction. However, if she eats more than 100 of her brood it causes her to immediately molt and grow and induces the type of pain and terror only gods can bear. She now wants her children to be killed and eaten by others which is why she lays in the Swordfish Islands. She is currently hibernating at the bottom of the sea overdue to produce a brood. 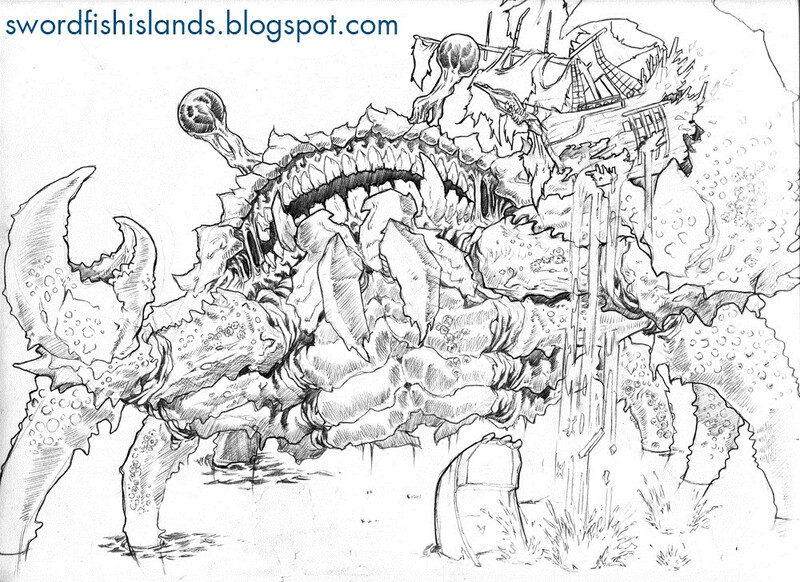 Her progeny are giant crabs in their own right and normally about 1000 grow large enough to swarm across the islands attempting to eat everything in their path. Most are consumed by the flora and fauna of the islands. If her children are not all killed and consumed in three days, Joomavesi will emerge from the sea (preceded by tsunamis) to find and consume all that remain. She is drawn to their location and cannot resist the pull. Monsters (especially wydarr and the coralkin angler) are in tune with the normal timings of the golden swarms and begin to gather in anticipation days before the event. The swarms of gold crabs normally emerge from the sea at Crab Mouth Lagoon (HS-14) and rush across Hot Springs Island.